Now that we’ve sold our first holiday home (available on airbnb here) in the Bay of Arcachon to my best friend, we are starting to plan some renovation work to modernise the holiday home we spent most time in France. One thing we are looking at revamping is our Ikea kitchen which I have to admit has not aged. Ten years on and the units are still looking very white and have not faded despite the huge amount of natural light filling the room. However, what has changed is our cooking habits (well mine mostly…) and requirements for space and storage. For starters, I cook now…which is something I wasn’t doing at all when I designed the kitchen over a decade ago and over the recent years, I came to realise that there was actually enough space to prepare the food when the two of us are in the kitchen. In addition, Steve finds it very antisocial to have his back turned to our guests when he is cooking. Added to the obvious lack of storage, there is quite a few things we could make right the second time around. 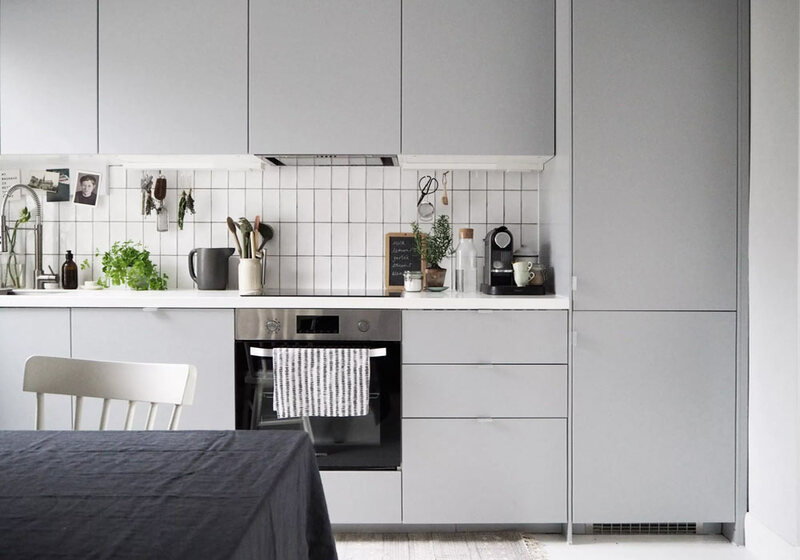 While I’ve always assumed that our new kitchen would be white, I have recently seen a lot of really nice grey kitchens so I thought I would throw it out there for inspiration and let everything sink in. Despite numerous and gruelling attempts at restoring our pine wood worktop to its former glory, no amount of sanding, bleaching and re-varnishing has worked its magic. It displays in-depth dark stains around the sink while a marble, resin or concrete worktop would achieve the clean, minimalist look I’m after. Storage is something not to overlook in a kitchen. Pots and pans in the end take quite a lot of space and if you’re looking at re-designing your kitchen, I strongly recommend you go for deep pull-out drawers rather than normal cupboards with shelves which are more affordable but a real pain to use. You will need to take out all the kitchen accessories stored at the front to access the ones at the end. For those who are less minimalist than me, I thought this modern country style kitchen was a good compromise. Which one is your favourite!? Really like the 6th and 7th pics, with the scrubbed pine table and floor which mix minimalism with homely. I have calls to make today for a new utility room and boot room, there are just too many images to help!! Argh… our utility room too could do with a revamp! That grey shade is really looking superb. I think that a cool wallpaper will make it more adorable. Only most necessary, but clearly, functionally and very stylishly. I am, where to be walked about to fantasy. Absolutely love all these kitchen designs, they are so clean and crisp looking with a rustic edge, love all the pendant kitchen lights too. Yes the Entrance Makleri is quite something! Really impressive piece of furniture design, specially the color combination of the seventh one. I’m currently renovating my kitchen and have gone for an anthracite grey handless kitchen with a stone worktop (quartz composite brand called Unistone) – with the worktop in a colour exactly matching the cupboard doors to give a seamless look. Sounds very dark, but it looks so fresh because I’ve kept everything else quite minimal, with white walls and no wall cabinets. Anyway, my reason for posting was to recommend the stone worktop, it was worth every penny (although it does cost lots of them!!). It looks and feels so nice, but practically it’s also so easy to clean and is resistant to heat and stains – should stay looking good for a long time. If you undermount your sink and have drainer grooves cut in then it gives a lovely minimal, clean look too. Thanks Caroline. Stone, Corian or some kind of similar stone composites is defo what I’m leaning to. I’m over wooden countertops. I will have a look at this brand thanks. Superb! perfect colours and love all kitchen designs. Astounding pictures of kitchen with grey and white background. It looks so simple and elegant. Thanks a lot for sharing. The black and white photo on kitchen wall and those gray colored racks makes a neo-noir theme. Please keep on sharing such pictures.